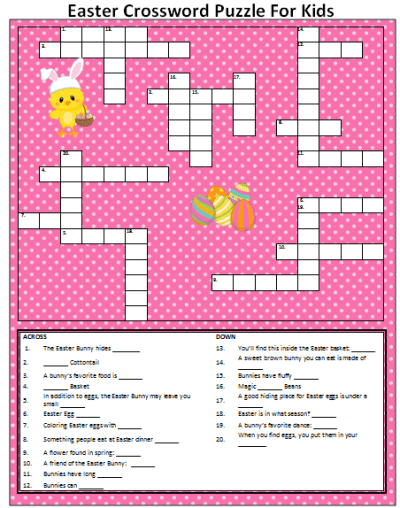 Another idea is to turn this Easter Crossword Puzzle for kids into an Easter Scavenger Hunt. To do this, simply highlight certain squares on the crossword for letters that will spell out a secret word. When the child has completed the crossword, he’ll have to take the highlighted letters and put them together to make a word. This word could lead to a special hidden Easter treat hidden. For more Easter fun, visit our Holiday Fun page and scroll down to the Easter section for loads of free printable games, activity ideas, Easter party ideas including tips for decorating, recipes, activities and more! For more printable games, check out our Free Printable Games page. We have so many different types of free games like charades, scavenger hunts, word searches, word scrambles, BINGO cards and much more. We’re always adding more freebies for family fun so be sure to stay tuned for the latest updates. To stay updated on the latest ideas (we’re always adding new freebies!) follow us on Facebook, Pinterest, Twitter or our new RSS feed on Bloglovin’. Come on over and join the community to see the latest ideas, share in conversations and even make suggestions for future blog posts. I love suggestions from readers!